The type of thermocouple on a DynaTrol (with the Blue face) can be either Type K or Type S.
You must have the appropriate thermocouples and lead wire to switch from one to the other; either Type K thermocouples and wire or Type S. See this link for more information. In the Hidden Menu you must switch the software setting from “K-TH” to “S-TH”, or vise versa. Pressing any number key toggles you back and forth from K-TH to S-TH. See this link and follow the instructions for "TYPE". For precaution, a small jumper must be moved on the circuit board when going from K to S.
This jumper is located approximately in the center of the board under the marking “R97”. On the other side of (as shown in the photo) is the marking "Type S". 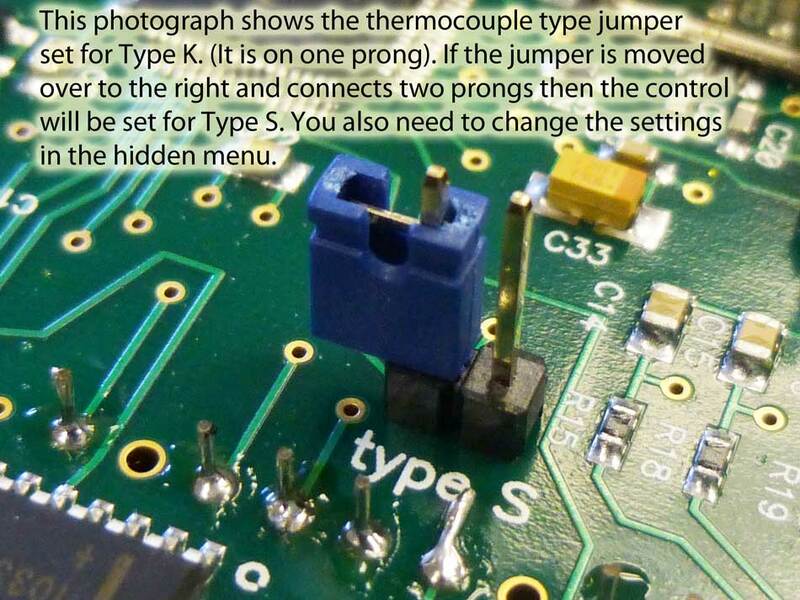 If the jumper is on only one of the prongs the control is set for Type K. If the jumper is on both of the two prongs the control is set for Type S.
This precaution keeps you from accidentally having it set for K with S thermocouples or vise-versa. If there is a mismatch between the jumper setting and the software setting you will get an error code: ERR9. CAUTION: (A severe overfiring can occure if you have the control programmed for a Type S thermocouple and you are using a type K thermocouple). The following is the standard practice describing thermocouple polarity for Type K and Type S thermocouples that is used on L&L kilns. The thermocouples are marked with a (+) and (-). Also the negative (-) is marked with a red marker. The negative wire is MORE magnetic than the positive wire. NOTE: Ground the outside metal foil wrapper to the negative terminal of the control. The thermocouples are marked with a (+) and (-). Also the negative (-) is marked with a black marker. See this note about the mismatched colors on Type S thermocouples vs the thermocouple extension wire in the USA. See this for information on how thermocouples work.